Panasonic has introduced its new Lumix DMC-FX500, which is the company’s first digital camera with a large 3-inch touch-screen LCD (230,000 pixels). This latest Panasonic Lumix FX500 incorporates 10.1 megapixel sensor, (25 mm) Ultra-Wide-Angle 5x Optical Zoom Leica DC Lens, Auto Focus tracking, Venus Engine IV processor, Intelligent Auto (iA) mode and the ability to shoot HD video (1280 x 720p), aiming to help consumers enrich the digital photography experience and capture better pictures. MEGA O.I.S. – Gyrosensors detect hand-shake and the lens system shifts to compensate, helping to prevent hand-shake from creating a blurry image. Digital Red-eye Correction – Helps eliminate the red-eye problem that sometimes results when taking flash shots at the night. Incorporated into the built-in flash, the camera emits a small preliminary flash before the main flash, detects red-eye and digitally corrects it. Intelligent Exposure – To help correct photos from being under- or over-exposed, the FX500 instantly analyzes the framed image and adjusts the brightness in areas that are too dark because of dim lighting, backlighting or the use of the flash. Intelligent ISO – Determines if the photo subject is moving and changes the ISO setting and shutter speed accordingly. Intelligent Scene Selector – Senses the ambient conditions, recognizes the shooting environment and automatically selects the appropriate scene mode from: Scenery, Portrait, Macro, Night Portrait or Night Scenery mode. Face Detection – Detects faces anywhere in the frame and automatically chooses the optimal focus and exposure settings so portraits come out clear and crisp. Detecting up to 15 faces, Panasonic’s Face Detection can even track a face if the subject is moving. Continuous AF – Maintains focus on the subject even without the user pressing a shutter button halfway, thus minimizing the AF time. 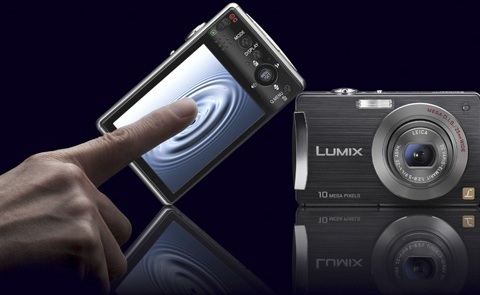 The new Panasonic Lumix DMC-FX500 that available in black and silver colours will be available in May 2008 for about $400.